Wiretapping And 5 More Trump Falsehoods As president, Trump's called for — with no evidence — investigations into alleged wiretapping by Obama and some 3 million to 5 million people he believes voted illegally. 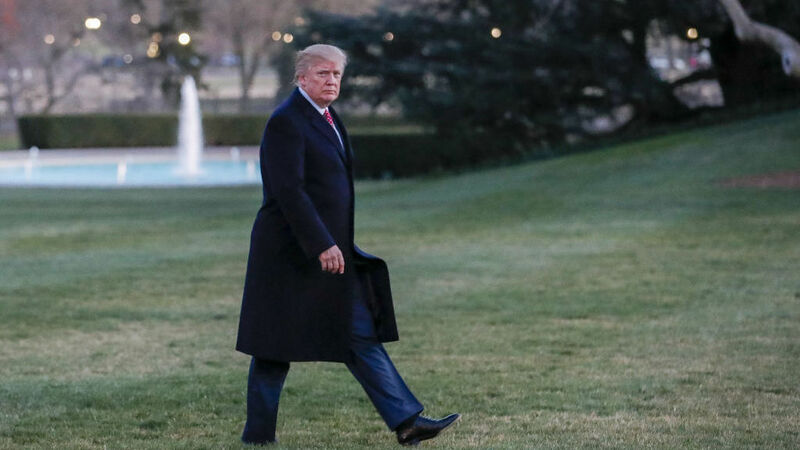 President Trump walks across the South Lawn toward the White House on Sunday. Early Saturday morning, President Trump launched into one of his favorite pastimes — tweeting allegations with no evidence to back them up. His latest unfounded claims: an assertion that President Barack Obama ordered wiretapping of Trump Tower during last year's elections. He accused his predecessor of "McCarthyism" and being a "bad (or sick) guy." The explosive allegations seem to have originated on conservative talk radio and were then promulgated by the right-wing Breitbart News, which Trump chief strategist Steve Bannon previously led. The site, which has ties to the alt-right movement, frequently peddles conspiracy theories. The White House, through Tuesday's press briefing, has still offered no proof for the allegation. A slew of "alternative facts" — in the words of Trump adviser Kellyanne Conway — have been perpetuated by the Trump administration since taking office. It's par for the course for the reality TV star, who rose to political prominence after questioning whether Obama was born in the U.S.
Just after taking office, the president again repeated an unproven claim that millions of people voted improperly last year. "You have people that are registered who are dead, who are illegals, who are in two states," Trump told ABC News' David Muir in his first Oval Office interview. "You have people registered in two states. They're registered in a New York and a New Jersey. They vote twice. There are millions of votes, in my opinion." As NPR's Danielle Kurtzleben has covered exhaustively, there is no evidence to back up such a widespread claim. While some instances of voter fraud do occur, there's no evidence of widespread fraud. And a 2012 Pew Charitable Trusts report Trump has cited does not, in fact, show any type of mass voter fraud. As for being registered in multiple states, digging by news organizations showed that some Trump staffers and family members were among those registered in two states — not uncommon, for example, if someone moves. It's only voting in both states that is illegal. Trump's claims culminated in him tweeting that he was going to be "asking for a major investigation into VOTER FRAUD, including those registered to vote in two states, those who are illegal and ... even, those registered to vote who are dead (and many for a long time). Depending on results, we will strengthen up voting procedures!" After Gregg Phillips with the conservative group VoteStand went on CNN claiming he had names of the 3 million people who voted illegally — but then refused to produce such a list — Trump tweeted out praise for him and said he was looking forward to seeing the results. The president later said in a Fox News interview last month that he was going to tap Pence to investigate voter-fraud claims. Over a month later, Trump has not signed any executive order calling for an investigation or commission to do so. Trump kicked off his first full day as president Jan. 21 with a visit to CIA headquarters — presumably to mend fences with the intelligence agency after he maligned intelligence officers during the transition. At a press conference earlier that month, he likened them to "Nazi Germany" for leaking damaging information against him and repeatedly cast doubt on their finding that Russia did, in fact, look to meddle in the U.S. elections. After a December Washington Post report on the CIA's conclusions, Trump dismissed the agency in a statement as simply "the same people that said Saddam Hussein had weapons of mass destruction." In his visit to the CIA, Trump denied there was any feud and said his comments had been misreported, when, in fact, they had not been. Some of his accusations were leveled on his own Twitter feed. What's more, Trump then exaggerated the response he got from the intelligence community there. Many current and former intelligence officers were fuming after Trump stood in front of the hallowed memorial to fallen CIA officers and launched into a tirade against the media and leveled more false claims over his inaugural crowd size. "I had a standing ovation like you wouldn't believe. ... They actually — they were standing from the beginning," Trump claimed in a Fox News interview later. "They didn't even sit down. It was one standing ovation, the whole thing." In fact, as the Huffington Post noted, Trump never told the CIA officers to sit at the beginning of his speech, and without such instruction from the president, these officers wouldn't have sat down. He also claimed that "it was the biggest standing ovation since Peyton Manning had won the Super Bowl, and they said it was equal." There were about 400 staffers at the speech. There were 71,088 fans who attended the 2016 Super Bowl, where Manning led the Denver Broncos to the championship. Another whopper that Trump and his administration clung to for quite a while was the size of his inauguration crowds. Though aerial photos — including ones now officially released by the National Park Service — show that Trump's crowds were much smaller than President Obama's, he's continued to assert exactly the opposite. Even when TV ratings are added in, it still wasn't larger. According to Nielsen, 30.6 million people watched Trump's inauguration, but 38 million people tuned in for President Obama's first inauguration in 2009. It is more difficult to ascertain streaming numbers, though his White House press secretary claimed it "was the largest audience ever to witness an inauguration. Period. Both in person and around the globe." Trump continued to dispute what clear photos and on-the-ground reports showed. At the CIA, he claimed that "it looked like a million, a million-and-a-half people" at his inauguration, but that the media had simply "showed a field where there were practically nobody standing there" to try to diminish his crowd size. Trump oddly also claimed it had stopped raining when he began giving his inaugural address. In fact, it was raining the whole way through. Franklin Graham said during a prayer from the platform: "Mr. President, in the Bible, rain is a sign of God's blessing. And it started to rain, Mr. President, when you came to the platform" to speak. To bolster his inaugural assertion that there's "American carnage" happening and that, as the new law-and-order president, only he can save the country, Trump has repeatedly relied on false and misleading crime statistics over the past six weeks. Trump told a group of law-enforcement officers at the White House at the beginning of February: "The murder rate in our country is the highest it's been in 47 years. ... I'd say that in a speech and everybody was surprised, because the press doesn't tell it like it is. It wasn't to their advantage to say that. But the murder rate is the highest it's been in, I guess, from 45 to 47 years." The press doesn't say that because it is false. The national homicide rate peaked in the 1990s and has largely continued to a steady decline since, though there was a brief spike from 2014 to 2015. As NPR's Camila Domonoske reported, "Even with an 11 percent annual increase, murder rates remain lower than at almost any point in the last 47 years." He's also made wrong claims about crime in major cities. Trump claimed that when President Obama gave his farewell address in Chicago: "Two people were shot and killed during his speech." However, the Chicago Tribune reported that police records show that, "Not only did no homicides take place in Chicago during Obama's address of about an hour Jan. 10, but the official Police Department records and the Tribune's crime database show that no shootings at all occurred over that time frame." And when Trump addressed the House GOP retreat in Philadelphia, he claimed the city's murder rate had been steadily increasing, when, in fact, the 277 homicides in the city in 2016 were down from 280 the previous year. Those are both sharp drops from the 391 a decade ago, in 2007. 5. "Biggest Electoral College win since Ronald Reagan"
Trump made this claim in a February press conference where he was again boasting about his win of 306 electoral votes (though it was really 304 due to two defections from electors from Texas). He tried to clarify when pressed that he meant biggest Republican win since Reagan. Still he was off. George H.W. Bush got 426 electoral votes in 1988. When pressed again by NBC's Peter Alexander on his repeated inaccuracy, Trump tried to dismiss it. "Well, I don't know," he said. "I was given that information. I was given — I actually — I've seen that information around. But it was a very substantial victory, do you agree with that?" Trump won, and winning with more than 300 electoral votes is significant. But his electoral-vote total ranks just 46th out of the 58 U.S. presidential elections.